While a candidate for a degree in architecture, Paul Anthony satisfied an elective requirement curriculum by signing up for a ceramics class. It seemed like a good and creative change of pace. His nonchalance lasted only until he saw a pot being “thrown” on the potter’s wheel. It was MAGIC! He was hooked! Paul’s architectural training and years of professional practice strongly influence his design decisions for the ceramic pieces he makes. His forms are generated from designs evolving from functions. Pots have purpose – they are to be used. He works with the hope that in the process of use his ceramic pieces will enrich not only those who use them, but also the purpose for which they are designed. 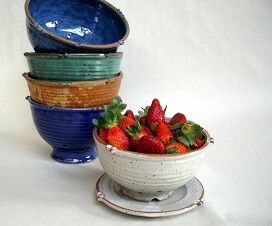 Paul Anthony pottery is located in Burnsville, North Carolina.